In doing research for my book, I became intrigued by the hammocks used aboard sailing ships. From what I could discover, the basic design of the “navy hammock” hadn’t changed for hundreds of years, since the time Columbus brought the hammock from the new world until the Korean War (to see some naval hammocks in action, I highly recommend the Horatio Hornblower series by A&E). I wondered if that was a testament to its utility and convenience and maybe even its comfort. My grandpa, who served in the US Navy during World War II, said that he loved his navy hammock and said that many sailors brought them home because they thought they were so comfortable. I’ve slept in a lot of hammocks, and while I’ll take any hammock over the ground, there are some I prefer more than others given a choice. In looking at reference photos and design parameters, I presumed that the navy hammock couldn’t be very comfortable—at least compared to Brazilian-style hammocks I enjoy—since the navy version is much narrower and shorter and is hung with a shallow sag. So when the opportunity came to buy a vintage World War II US Navy hammock from eBay, I didn’t hesitate to do some first-person research. As far as I could determine, the hammock I purchased still had it’s original clews, or hammock suspension, with natural fiber rope nettles and a steel O-ring. The hammock itself was made from a thick piece of canvas and was very stiff (likely due to its age). There are 12 steel grommets on each short end. The fabric was stained in a few places and had a variety of unpleasant smells (I can only imagine the stories behind each one!). After a few hand washings, the canvas became more flexible and the stains and smell were minimized (although my kids still say it stinks). Each clew has 12 nettles and each nettle has a bight at the end that attaches to the hammock through a grommet. A piece of 5/8″ (1.6 cm) thick hemp rope, approximately 41″ (104 cm) long threads through each bight as the nettle was fed through a grommet. It is an ingenious design, allowing the hammock to be quickly and easily disconnected from the clew for washing or repair work. In addition, the thick hemp rope prevents the short hammock from gathering up too much, thus retaining the lay of a bigger hammock with the size of a smaller one. Although the nettles were looking worm, I decided to give the hammock a test run indoors. I hung the hammock with a shallow sag, mimicking the photos I had seen. To my surprise and delight, this hammock blew me away with its comfort. I was able to get a diagonal lay and I was surprised with out “flat” I felt. I believe the stiff fabric contributed to the flat lay by preventing my heavier torso to sink lower than my legs. I should note, however, that I believe sailors did not typically sleep on a diagonal in their hammocks while at sea. The sides were meant to wrap around the occupant, which helped prevent spill-outs, and allowed the occupant to rock back and forth safely while the ship was battered by the sea. Some photos indicate that sailors affixed a spreader bar, likely to limit shoulder squeeze. With the shallow sag and the way the fabric is “gathered” at the ends, sleeping in-line is also not horrible, but not my first choice. When sleeping diagonal, I had no shoulder squeeze issues. I enjoyed a few nights in this hammock before some of the nettles finally wore through. I knew I was risking a failure with how old and worn the nettles were, so I decided to reconstruct the clew. I found several variations for tying the shouldered sword mat knot that is used to gather the nettles together at the steel ring, but none of these duplicated the US Navy design. I finally found a photo series showing a tutorial, that was close to the US Navy design, but it offered no other details or step-by-step instructions. I hated to take apart the original clew from my vintage hammock, but it was the best source I had to replicate the design. In the end, I had to do a lot of experimentation until I got something that worked. I also decided to make a replica hammock and preserve the original. The folks who maintain the HMS Richmond have some great documentation on the Royal Navy Hammock, but the dimensions and design are slightly different for the US Navy hammock. My instructions are based on measurements I took from the vintage US Navy hammock. The video is roughly 9 minutes long, but I wanted to make sure I walked through the process clearly enough. Please let me know if you have any questions! UPDATE 3/22: My first replica was made from #12 Duck canvas, but that proved to be too thin and eventually ripped through at the grommets. I took the #12 from the pattern on the HMS Richmond site. I’ve found that the #4 (24-oz) Duck canvas is more in line with what my vintage hammock was made from. I’ve updated the illustration to match these findings. Now that’s cool. Thanks for sharing! Sweet, always wondered about sailors and hammocks. Supposedly there was a hammock designed for the M1 Abrams, but I never saw one. We had one in our tank but if you were over 3 feet you would not fit in it. we held up our tarp with. the ilistration above were it is lashed cosed is with mattres in it with wool/cotton blanket and a mattres sleave. Distribute the bedding evenly over the length of the hammock leaving about six inches clear at each end to prevent bunches of bedding and blankets oozing out of the ends when it is lashed. Lower the hammock until it is breast high, and stand on the left side facing the head. Pass the lashing over the hammock and reeve the end through the eye and draw taut; this is the first turn. There are to be a total of seven turns as shown in the diagram below. Traditionally, one turn for each of the seven seas. Coil the lashing up and pass it up and over the hammock with the right hand and bring it under the hammock into the left hand, then over its own standing part and haul taut by swinging back on it. This hitch is called a marline hitch. The final turn is taken around the neck of the hammock at the foot and is secured on its own part by a half-hitch. The end is then passed neatly along the hammock under each turn. The clews are stowed by twisting the nettles round right-handed and tucking under the turns of lashing along the hammock. Great tutorial. I’ve thought about trying this style since it would be easier to launder than my current mayan hammock…although I do have all the gear to do it. This gives me the measurements I needed and the hardest part, which is the clew. I’ve been researching this for a while and just came across your video. Former merchant seaman with SOCONY-Mobil Oil Co. Over 50 years ago.Made mine by following Graumont-Hensel’s Encyclopedia of Knots, p.624. Canvas from sailmaker’s shop near the U.S.S. Constitution. Learned my fancy knots and rope work and applied it to the hammock. Found Chief Mate in it one day after the 8-12 watch!! Hammock retired just like me except its in my sea chest. What a life it was! Awesome! Thanks for sharing. I’d love to visit the USS Constitution one day. Do you know where I can purchase one online? I have one like you describe too – a heavy duty canvas one that we grandkids sat on it at “the lake” over 50 years ago. Needless to say, ours finally broke and is really in gross shape. I’ve ordered another of similar size online, but the material is flimsy and it fell apart after only one year. It is hard to find really thick, sturdy ones with metal grommets and hanging rings. Aside from having one custom made (because I’m not sewing-savvy), is there a website where I can get our old “army hammock” replaced?? Thanks. There may be some specialty shops, like those that support the USS Constitution, but its hard to find them online. One canvas hammock available is from The Ship in a Bottle, but it has spreader bars. You might ask the owner for some custom modifications if you want an authentic Navy hammock. If I find anything else, I post it here. My focs’l Accomodation deck head is only 6 ft and length is only 14 ft and I want to accomodate 4 sailors on each side..so upper and lower hammocks. I had in mind using a box type hammock with spreaders at each end to reduce length requirement and reduce sag..any ideas where I can find instructions for this type of hammock? Could you send me a diagram of your deck? I’d like to see what portions we can play with. The box hammocks are pretty specific. I think we can better fit the navy hammock with the traditional shallow sag. Send me an email. Nice article you posted on Navy Weaving. I have been trying to locate info on the canvas material artwork also done by ole sailors or Boatsinmates. They unweave a piece of canvas then re-weave the threads into marinter designs. Anyway pls fwd me any links to such crafts if you see anything on this. Thank you. I’m not as familiar with the technique you describe. If I come across anything, I’ll post it here. We did a lot of canvas work on the Quarterdeck of the heavy cruiser Los Angeles,CA 135, and it was called “Macnamara Lace “. It was made by unthreading canvas, then tying designs into it. A lot of work, but well worth it when finished. and use it on some of my nautical style woodworks etc. I am making a great hammock for myself at local beach at Monkey Moutain, Da Nang. I have your book, It was a very good read and helped me a lot. I started getting interested in naval hammocks some years ago, and ended with one Royal Navy from the 50’s, two WWII USN, one with sewn grommets and the other with brass grommets, one WWII jungle hammock and one Vietnam era jungle hammock, one thing led to another and now have also two travel hammocks (one DIY) and two Mexican Mayan hammocks. 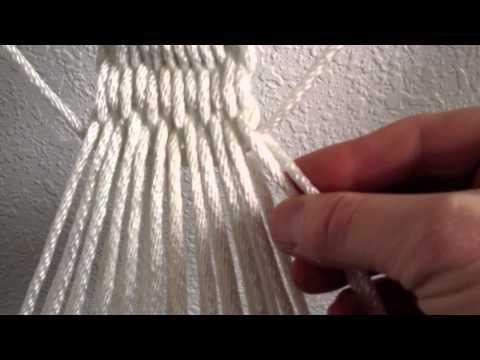 This also led me to restart my interest in knots and rope craft, and now I even sell paracord bracelets and other stuff. By the way, if anybody has info on where to find or how to make the hardware to transform a 50’s Royal Navy hammock into a cot, woul appreciate it. I have a doubt though, about the lenght of the nettles. After you weave them, are they the same lenght?. The Royal Navy clew has the side nettles 2 inches shorter than the two in the center, so it keeps you from falling to the side. My WWII hammocks seem to have nettles all the same lenght, and they work well enough, but I prefer to give the side nettles an extra turn around the rope toggle to shorthen it. Maybe when you hang the hammock taunt like the sailors it didn´t matter. But if the nettles are longer at the sides as they appear to be in the jig, it can cause the sides to fall bellow the center of the hammock, as would a garden hammock without the spreader bar. Have you had any troubles with that? A good source of info on different hammock making techniques for each of its parts is the book Hammock Making Techniques, by Penelope Drooker (1981), specially if you like knotting and weaving. Ricardo, thanks for the great input! I enjoy doing the knot work as well, and it has been fun to make some of these “early edition” hammocks. You are correct on the nettles. There is a difference between the Royal Navy and US Navy hammocks with the nettles, although both do shorten the last end nettles to tighten up the sides. My jig does make the end nettles shorter. If you look closely, the hooks are set a little higher than the rest, but the for the US Navy hammock, the nettles can be all the same length. This is different, vastly different, than a hammock with a spreader bar. With a spreader bar, the nettles get progressivly longer as they move out from the center point. The jig I have is intentionally narrow and this is mostly to make the weaving process easier. In the end the nettles are roughly all the same length in the end. This mimics how a gathered end hammock works. Great to know that the nettles end up having the same lenght. The Drooker´s book is indeed hard to find. I found it in amazon just by luck, looking around for books on hammocks, and got a used copy for 17 dollars. Right now the two offered are 100 and 200 dlls. Another book on hammocks is a coffe table book with potos that I got for one cent. The book by Denison Andrews I got it for 3dlls. on eBay, when they ask up to 60 dlls for it. Drooker´s book covers the fabric gathered end hammock with the sewed tunnel at the end. I just wonder how come that design just got popular in recent years, when it is so simple and efective. The navies of the world began the use of nettles with complicated knotwork when it would be much easier just to make a simple sailcloth rectangle. Don´t know if it was because sailcloth was too expensive or because of the sailor´s taste for decorative ropecraft. Space aboard ship was at a premium. I know that hammocks were a sensible solution for a number of reasons, one of them being space. Hammocks were hung tight shoulder-to-shoulder, although with two different watches, this gave the sailors more room to sleep as they would sleep in every-other hammock. Designing the hammocks with a very minimal size is no doubt part of those space requirements. Availability of resources, nature of sail cloth, and multi-use all factored in to the design. Aboard ship, resources were not wasted, so making large hammocks completely out of sail cloth was probably a waste when a smaller size did the job. Making a gathered-end design without the nettles is also difficult due to the thick sail cloth (it just doesn’t gather or bunch up very well). The nettles performed this job much better while eliminating the “wasted” fabric on the ends that isn’t used as the bed. As you know, the hammocks also doubled as shrapnel protection — sailors would hitch up their hammocks and bring them topside where they were hung on the bulwarks to keep bits of splintering wood from impaling sailors when hit on the broadside. For the US Navy hammocks, I know the nettles were designed to come off easily so the hammocks could be periodically washed. Rings and nettles could be removed if worn, or if the hammock was worn, so it was a useful design. I think the other navy hammocks could do the same thing, but I don’t have clear documentation on that. I never thought about the different watches, that makes a lot of sense, and explains how they could sleep with the hammocks so slose to each other. also what size dyneema was it for the light weight clew? also was it a full 50 feet for one clew? It will depend on the size of your jig (how long you want the clew) and the rope diameter. I didn’t measure the dyneema version. The rope was about 50 ft each side. Yes. I’ve made one out of polyester tablecloth from tableclothfactory.com. You’ll need to reinforce the edging where the grommets are placed. I’m currently working on making one out if an army poncho liner. Thank you for sharing. Cheers from Brazil. Great Hammock, we had one back when I was a kid from my Dad. He was A WW2 Navy vet. We are having fun making a new one. I inherited a hammock that my grandfather made many, many, many years ago. We have used it every year we’ve been camping for as long as i can remember (and long before then as well, lol). Thank you for the tutorial, because now, not only can i see how he made it, we have instructions incase we ever need to make repairs. Derek, was that thread 1/4″ braided poly? The sewing thread? It shouldn’t be thick at all–just regular sewing thread. how many hammocks or bunks were in 1 cabin? how many people slept in one bedroom on board? please help doing project on the navy and need to now these answers soon!!!!!!!! In the old Navy ships, such as in the 1700 and 1800s, the sailors would all sleep together on a deck. Depending on the size of the ship, that might be the mess deck, where the sailors also ate, or on the gun deck, where the action occurred. How many hammocks were on each deck again depended on the size of the ship. Sailors were typically allotted 21 inches, but often slept in shifts so only half of the crew was sleeping at a time, which allowed for more room. During WWII, the conditions were similar, although there was often more room aboard ship (see also Warspite). A good resource is master deck plan for the USS Constitution. I was curious as to where you got the 1″ steel grommets? I havnt been able to find them anywhere..
Steel can be hard to find, but there are many places to get brass, which is pretty common. Harbor Freight has some inexpensive sets. There’s also a metal grommet website with several options. The hammock in my tutorial is closer to 40 inches wide, not 18. The nettle loom is 18 inches, but the nettles are not the same width as the hammock for an important reason: the ends of the hammock are gathering together, making the ends narrower as the hammock reaches the end of the clew. The nettles are an ingenious method for constructing a hammock because they reduce the overall material required for the hammock itself. The nettles/clew represent the end point where the hammock is gathered together, but it eliminates the bunching the material would naturally do with other designs. This helps eliminate some ridges in the material and keeps the long edges from getting too tight. The other reason you don’t need to make your clew loom very wide is that the nettles themselves can splay open to accommodate many hammock widths. What is more important is the length of the loom, but we can get into that another day 🙂 Email me if you have any other specific questions. My Dad fought in WWII aboard two ships, as a Plankowner of WASP (CV7) lost at Guadalcanal, and then Lansdowne, a destroyer. He often talked of missing his hammock. Later as a Submariner, I often thought that hammocks would have been better than our too short, hard racks. Thanks for sharing! Great story. Soooo cool. We had these up north at our family cottage, and I never knew their origin. Ours finally wore out and the set that replaced them are in need of replacement! I’m going to try to make one…. PS are your grommets 1″ exterior dimension or interior? I’m guessing from your diagram interior, but it would help to know! Sorry, meant to write *exterior* dimension. Thank you for this tutorial. I just finished mine today and I love it. Having a bit of a time getting it to hang shallow, what do you suggest for a hook-to-hook spacing? Hook to hook or ring to ring? I suppose either would work. Two hooks will just connect together. Use a carabiner between two rings. Okay. So what would the ring to ring distance be? Basically, I’m asking if I were to build a stand for this hammock, what distance apart would you suggest for the hang points? Now I’ve lost you. 🙂 you are looking for info on setting up your hammock to a stand or indoors and you want to know the right hang height and angle? Have you tried the hammock calculator yet? Yes. Kind of. But wondering what the hang angle should be as these are usually hung very shallow. Also it seems I should have used spur grommets as I’m beginning to see the loose ends from where the hole was cut slipping out the bottom lip of the regular grommets I used… 😕 I wonder if anyone else had a similar problem. I use a 15 to 20° hang angle. Hi. What is the thickness of the original rope in the clew? I recently toured the original city jail of Cripple Creek, Colorado. It is now a museum, jail having been decommissioned around 1972. Interestingly, to accommodate it’s number of convicts, the jail routinely used up to eight hammocks per cell. The hammocks were hung in the evening and picked-up in the morning. I am going to sell my Dad’s WW II Navy hammock. Thanks for the info on how all the parts work together. Is the clew just decorative or does it help spread the hammock load more evenly out without it? Macrame was part of a sailor’s past times, so I imagine that some of the clew was only decorative. The shoulder sword mat weave I show here is just one example. I think it does add some structural support to the clew, keeping things tidy and secure to the ring, but you can use simple Lark’s head knots as an alternative. But digging more into your question, the clew was a solution to helping create a simple hammock design. The “bed” area on the Navy hammock was small, just 3 x 6 feet or so. If you gathered the ends of that canvas, it wouldn’t be big enough for a cat to sleep on comfortably. The clews extend the length of the hammock without adding to it’s bulk. 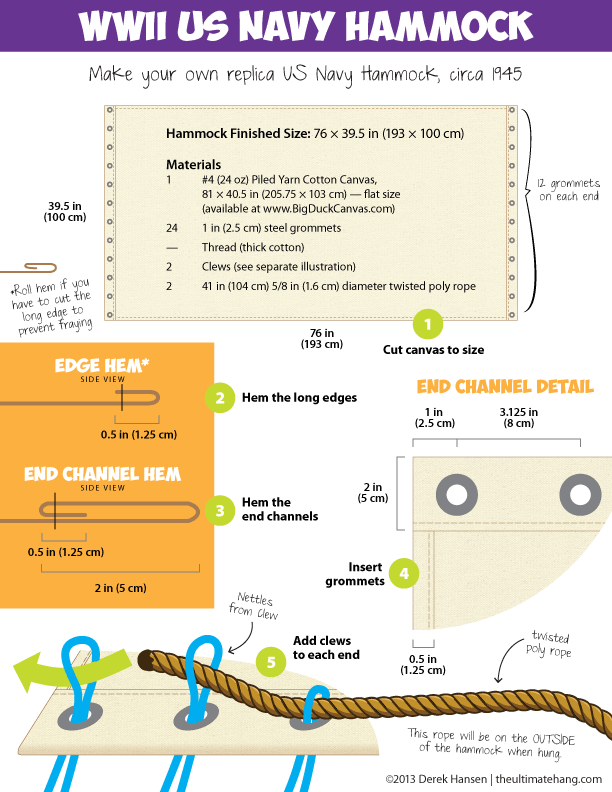 You can also make the hammock as long as needed by just tying longer clews. The bed itself doesn’t need to change much. Some sailors would adjust the way the clew was made to either make the sides roll up tighter or looser, depending on their preference. The original Navy #12 Duck canvas had handmade grommets made out of line/rope formed via of knotting. These were then stitched in, my guess is this is more durable then metal grommets? Just noticed in the original the B-B section that houses the grommets is folded 2 full times onto itself, giving a thickest of 3 layers of canvas, would that work over the heavier canvas you used? It looks like you just doubled this area? When I was growing up in pre-airconditoned sultry Houston in the 1950’s we built a small screened-in back porch off the back door to house Mom’s old wringer-washer, and our small dog’s doghouse; he slept there to prevent getting heart worms, contracted via mosquito-bite. When I was 11, Dad found a WWII style Navy hammock at a military surplus store for $12, and secured it diagonally under the 9′ porch roof. I entered the hammock by stepping from the roof of the doghouse below, and slept with a sheet and blanket –and my cat–all but the coldest months. People could come and go under the hammock on summer afternoons when I would lie in it reading library books. Dad mounted a small fan on the wall under the roof to keep me cool. I adored this hammock, and miss it still. It was so comfortable, and I loved being able to push a foot against the wall to make it slowly swing slowly on muggy afternoons. It was also wonderful to sleep rolled in the blanket with a warm cat during night-time rainstorms. I guess that the support under your torso is based on the fact that you build the clew on a rectangular frame: this produces a hammock that is shorter in its center than at the edges and therefore provides more support in the center. Some other clews are built on a circle which corresponds with a normal gathered-end hammock made out of a rectangular piece of fabric. Greatly enjoyed this. Researching, came across a reference to regulation requiring 18” of clearance above hammock. Took that as clue to hang angle. 18” produces 30° hang angle if the bed is taken as only 6’; how long are the clews? Also read that some sailors substituted their own 7’ hammocks: more sag. Seems cotton batting pads were laid upon inside the hammock in some cases, and just wool blankets in others. No mention of UQ concept, which seems truly a modern innovation. Thanks! Sounds like we’ve both found similar sources. It’s amazing how well those hammocks held up over the years. The military used hammocks up through the Korean War. My grandpa remembers his fondly as you describe. But as modern age intercepted the military; hammocks began to seem antiquated. The rope and canvas sailor was being replaced by modern steel and rubber. The material advantages began to slow. I’ve also found sources citing sailors who complained about the hammock, so it wasn’t universally loved, I’m afraid to admit. The backlash of the Vietnam war took its toll on the military and civilian worlds having close ties so some of the hammock evangelism was severely curtailed. OMG my inlaws just purchased a hammock that I put up for them and first thing I noticed is that the hanging rope wasn’t going to last. Me being a fan of paracord as I make bracelets etc from it I said I must find a way to copy the hanging part and replace with strong paracord. As I searched I stumbled on this video and as Law of Attraction worked it’s magic this tutorial is EXACTLY how the hanging part is. Exact design …. I got excited as it seems simple enough. However I wanted to know if I sent you a pic of the size etc could you give me an idea of how much paracord I would need? I really appreciate your help.